Methodology of training 2.0 – Component 1: Individuality. | Helping the best to get better! ← Last week of the year. Methodology of training 2.0 – Component 1: Individuality. Strict individuality is probably the most promising component of the attempt to improve our training. Simply because almost everybody recognizes the need for an individual approach to training, while almost nobody really does that! Many coaches talk about “the program” or “my program” which in any case displays a generalized and averaging approach to training, not an individualized one. 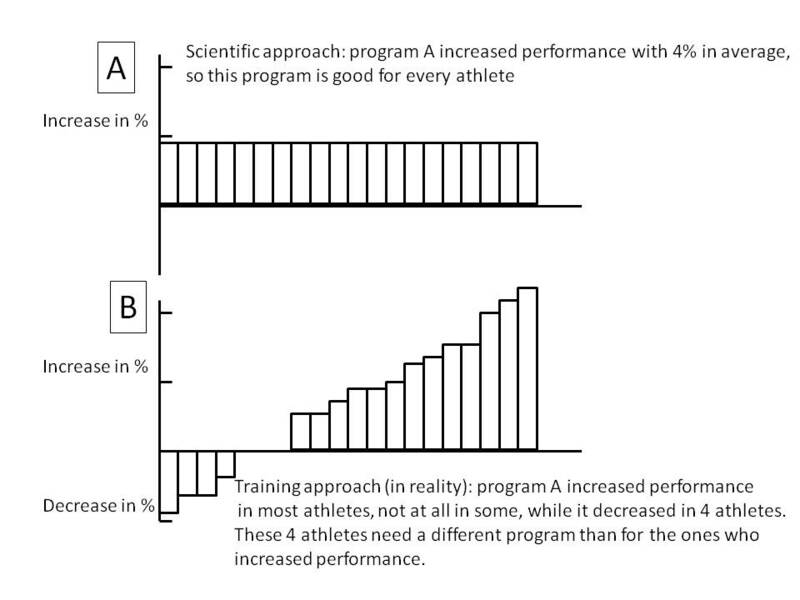 One single program, no matter how flexible, being applied to more than one athlete is always suboptimal in my view. How right they were, a long time ago. Now why don’t we strictly apply this principle of individuality? Well, the answer is easy: for sake of “efficiency” . If you have a team or a group of 50 athletes, how can you manage to provide all of them with a strictly individual program? This sounds like a good excuse, but basically it just isn’t since I really understand that in a team sport we have to make sure that our tactical and technical concepts have to be executed through group training. But the main impact of the training load is in the conditioning and there it is relatively easy to individualize the training, this is the great opportunity for S&C coaches: individualizing the training of each athlete to his/her own capacity and needs. To be really successful in elite sports one has to move away from the averages, the information gathered by research done on average athletes or sport students. The information from this maybe might apply to the average athlete, but not the unique “ genetic freak” that we coach in elite sports. And for sure not to all individuals that we coach. The graph below explains that science tends to average and to generalize (A). The “one-size-fits-all” approach has no place in elite sports, since not every athlete responds the same to the same program. Your perfect program might be the end of my career, you favorite exercise might become my injury, your favorite food might be my poison. 1. the fitness-industry (this word already tells the story) based on the needs of the general population and the need for “new and improved” fitness trends: Jane Fonda, aerobics, jazzercise, steps, spinning, Tae Bo, Zumba, boot camp, cross fit, core stability, functional training, kettle bells, Swiss balls, just to mention a few temporary fitness trends. It’s just the same like in diets: the more new fads in a short time frame, than you know for sure: it’s not going to work for long, otherwise they would stay forever. Elite coaches: these ideas might be good for the average, semi-sedentary non-elite population, these have, at most, a very small place in the training of elite athletes. 2. pathology or the countless therapies trying to correct deviations from the “norm” and confuse pathology with supra-physiology, like in former days doctors thought that an cardiac hypertrophy was a kind of disease. Think about how many athletes have been discarded or neglected in the past because they had a scoliosis or flat feet, thinking this would certainly predispose for injury or limit performance. It looks like a paradox: we want an athlete to be average, but not to be average. Remember the common limitations for the ultimate athletic performance that need to be corrected: leg length difference or foot pronation? -strict individualization of a training program is a very important key to success in elite sports: it’s custom-made by the artisan for every unique athlete., not mass-produced or “copy-paste”-work. -be very critical about concepts coming from fitness or form pathology, look at the target population of these fields! Leaves me wishing my readers a very happy, healthy, and successful 2015! One Response to Methodology of training 2.0 – Component 1: Individuality. Very thoughtful post Henk, thank you.